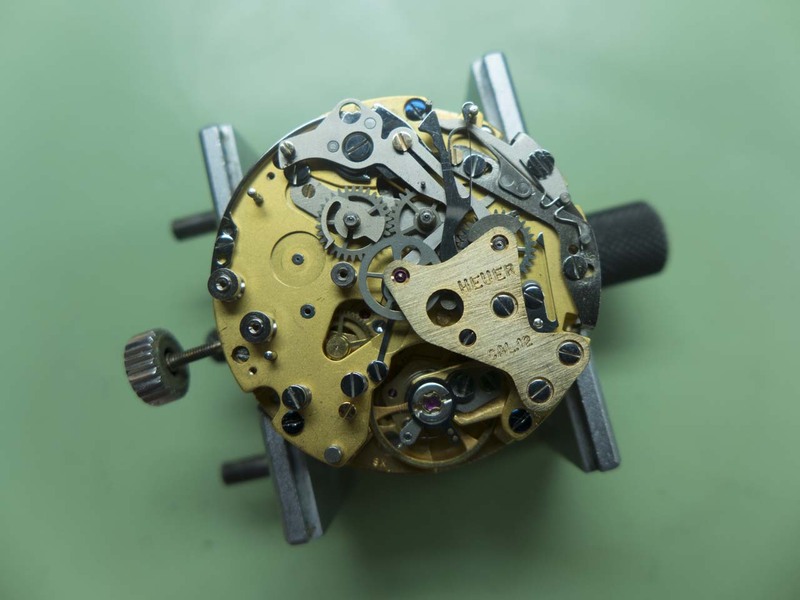 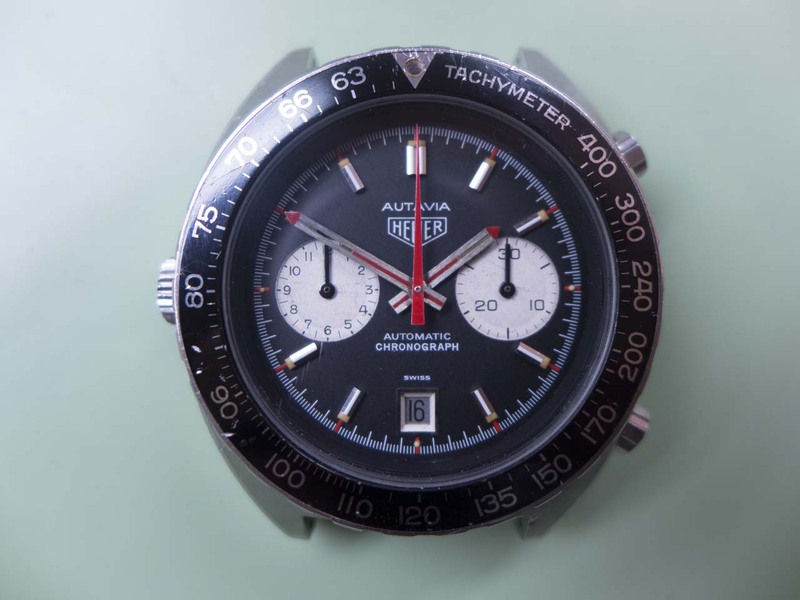 The Heuer calibre 12 movement was a development of the calibre 11 which preceded it, and the calibre 11 was developed by the ‘Chronomatic’ partnership of Heuer, Breitling, Hamilton-Buren and Dubois-Depraz in an attempt to be the first to the market with an automatic winding chronograph. 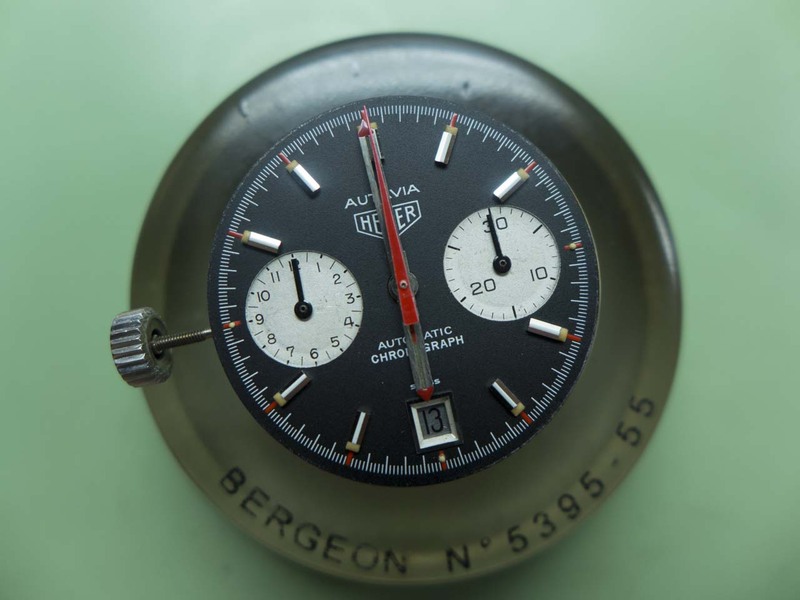 It was revealed to the press on March 3 1969 in press conferences in NewYork and Geneva and was manufactured until about 1973. 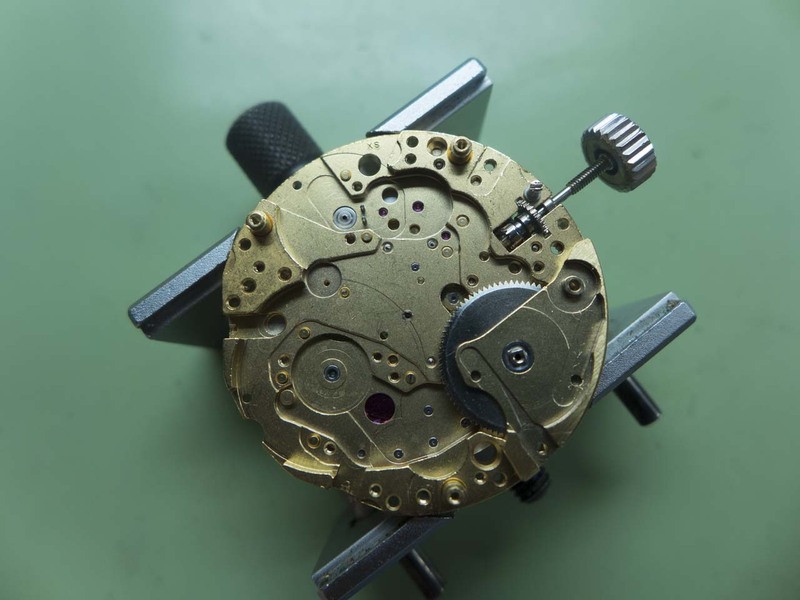 The calibre 12 was introduced in 1971 and was produced until 1980. 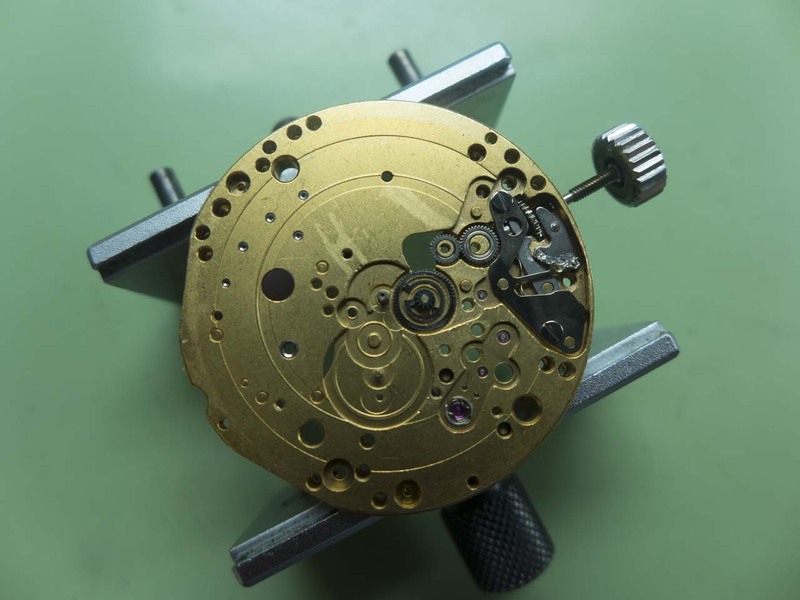 The calibre 12 addressed a few of the issues that appeared with the calibre 11’s, modifications included using lighter jumper springs, a weaker mainspring to drive a redesigned date mechanism, some strengthening of various levers and hammers and a faster beat rate of 21,600 as opposed to the cal 11’s 19,800. 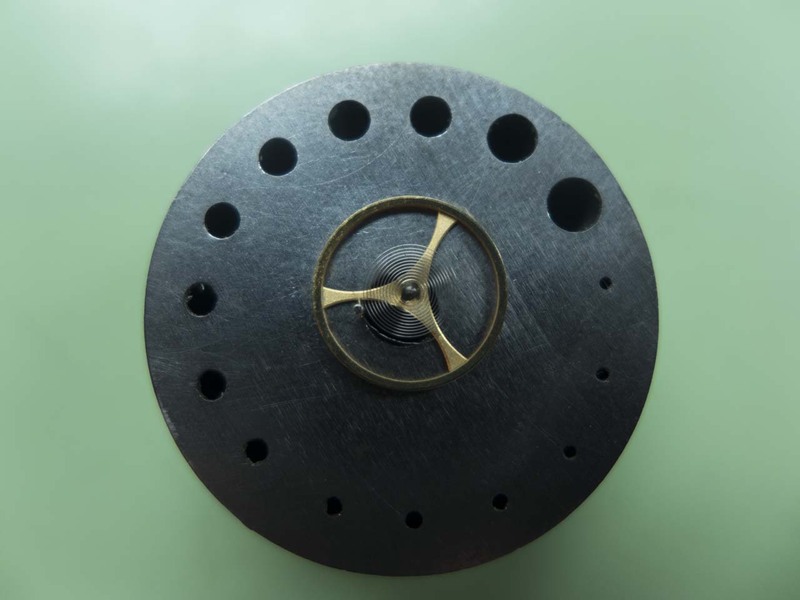 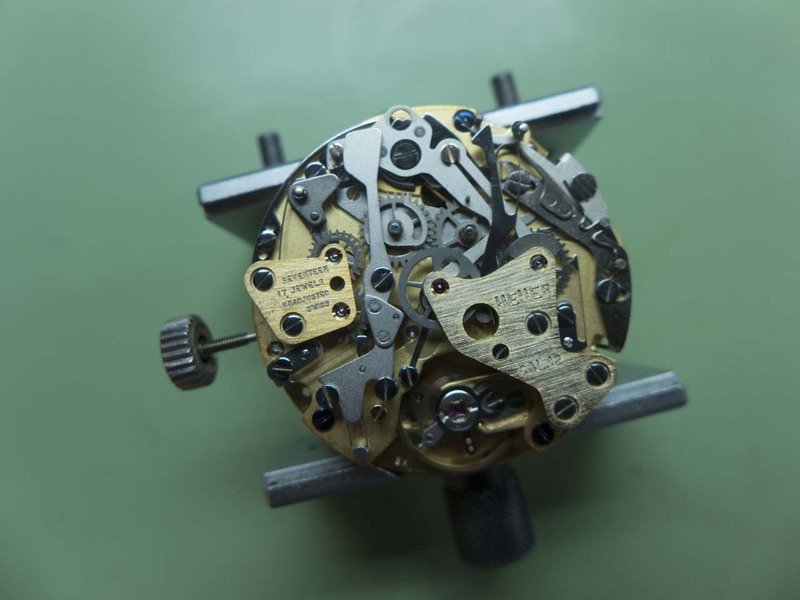 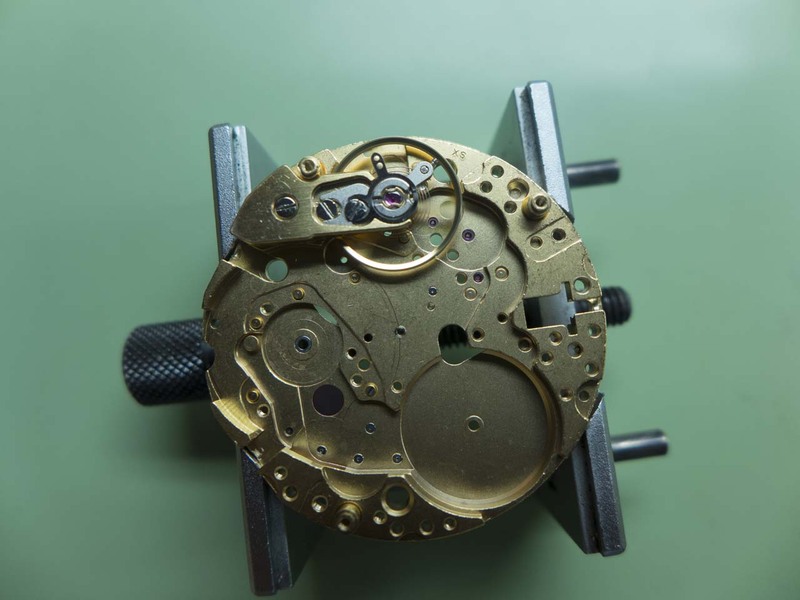 This family of chronographs do have a few weak points, the intermediate setting wheel tends to wear the mainplate if the lubrication degrades and the lack of spares can cause issues if the mainspring or micro rotor bearings are worn. 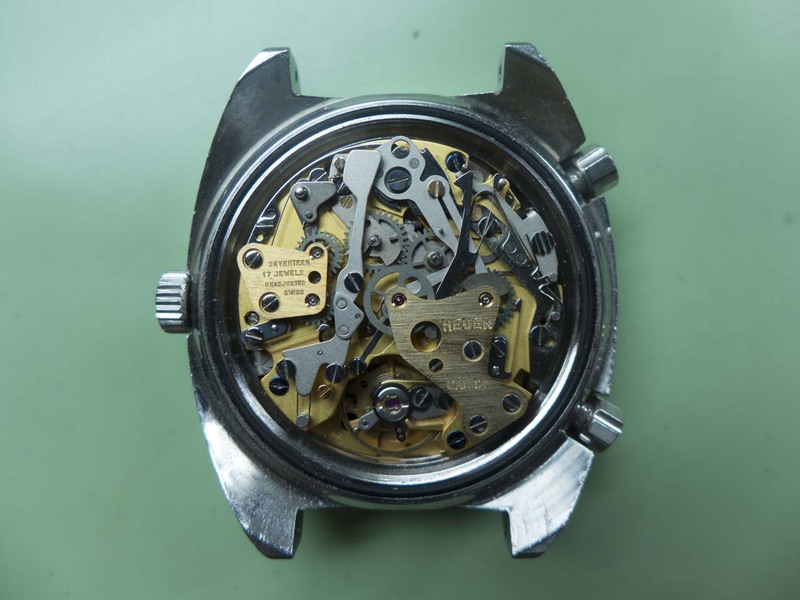 The caseback on this is a sturdy affair. 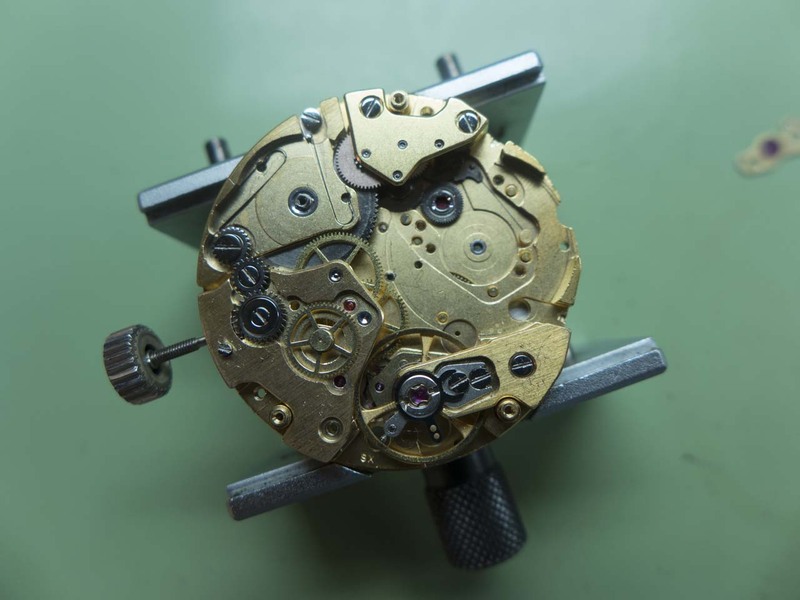 With it removed you can see the distinctive movement. 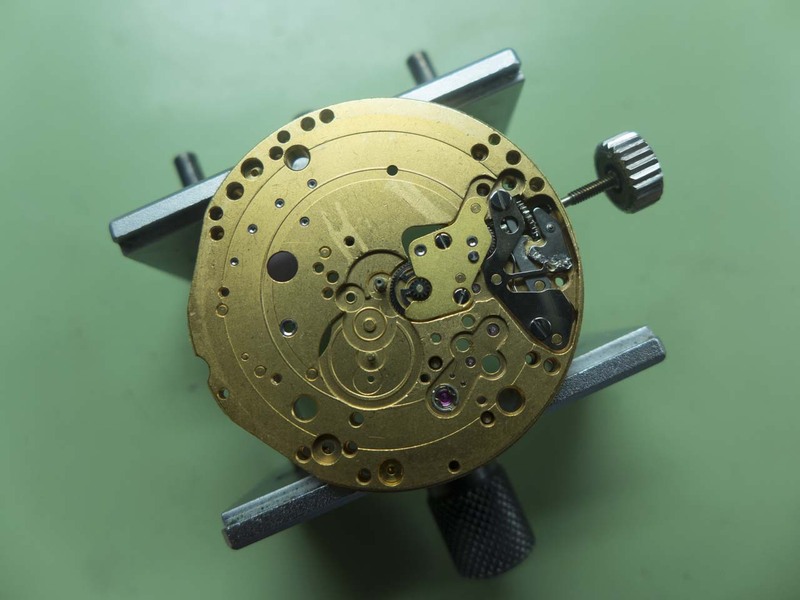 In this shot I’ve removed the movement and am ready to strip the hands and dial. 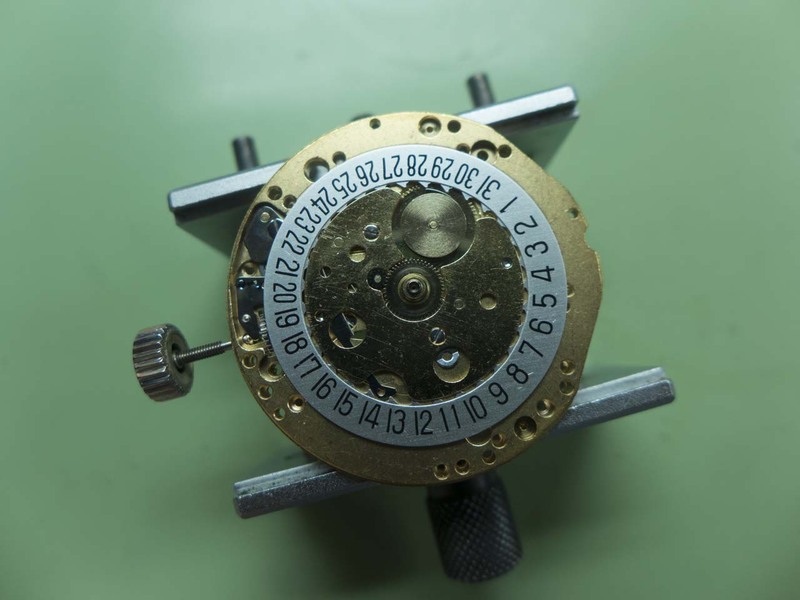 Underneath is the calendar mechanism, motion and keyless work. 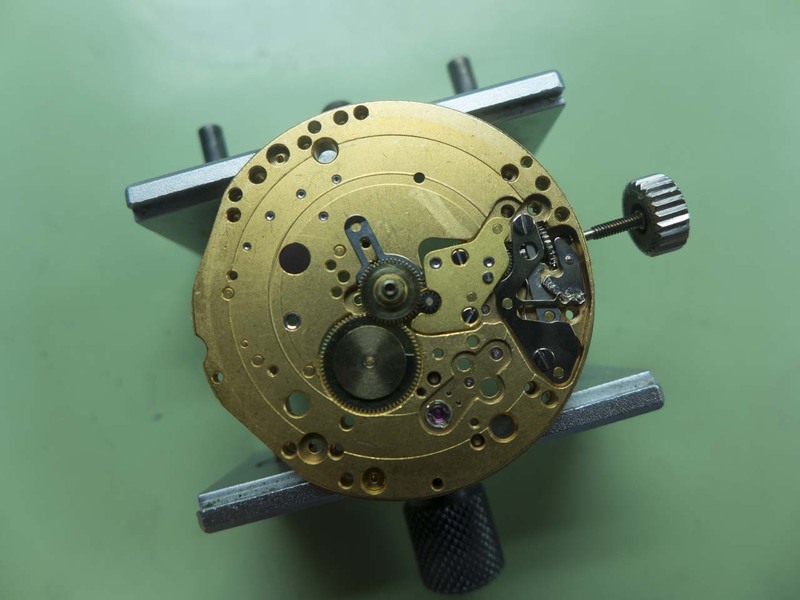 Turning the movement over I start with stripping the chronograph lever work. 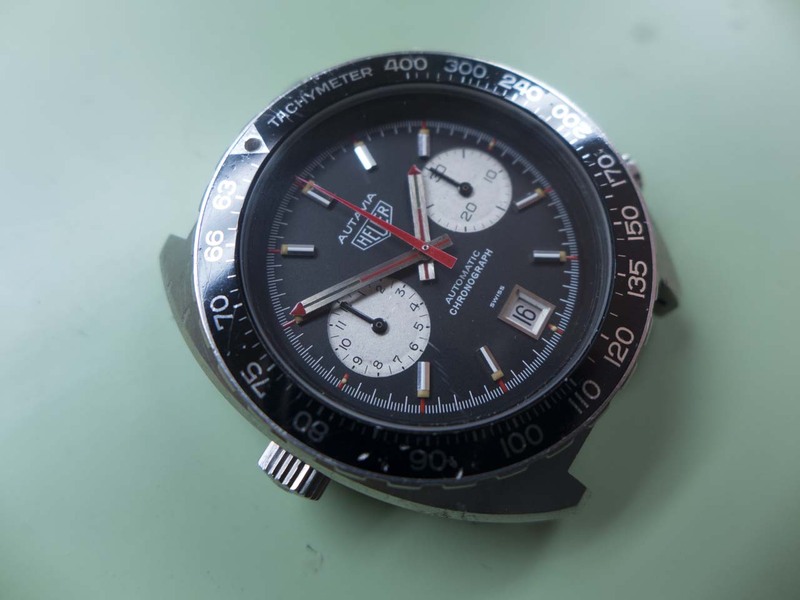 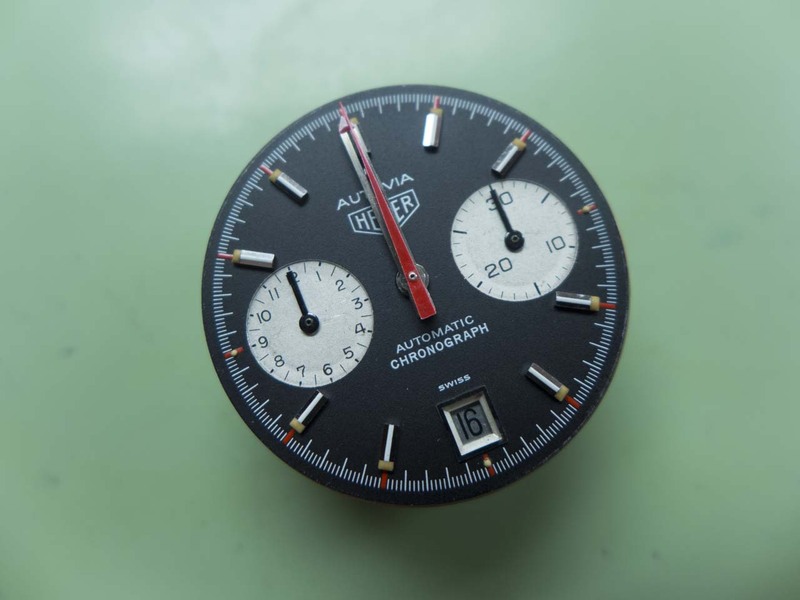 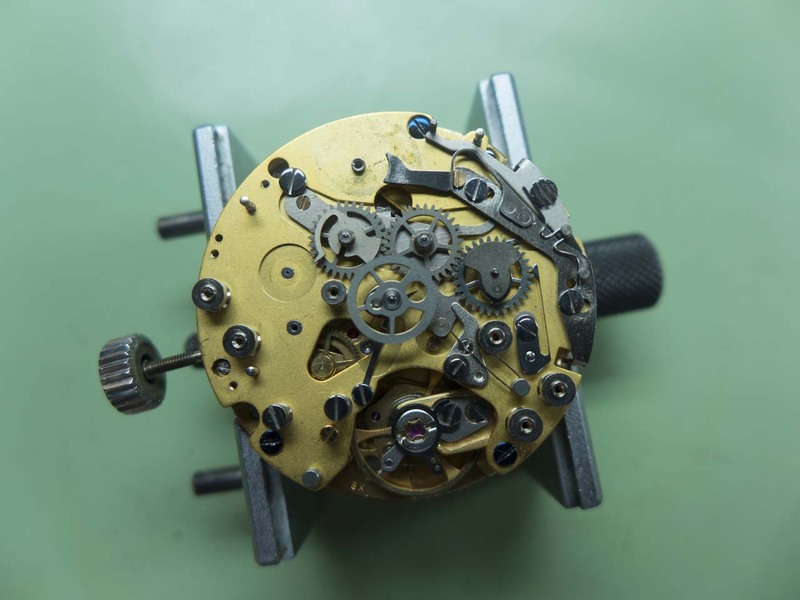 A nice feature of this calibre is the modular system of assembly meaning if you need to address anything to do with the wheel train the chronograph work can be removed completely with just three screws. 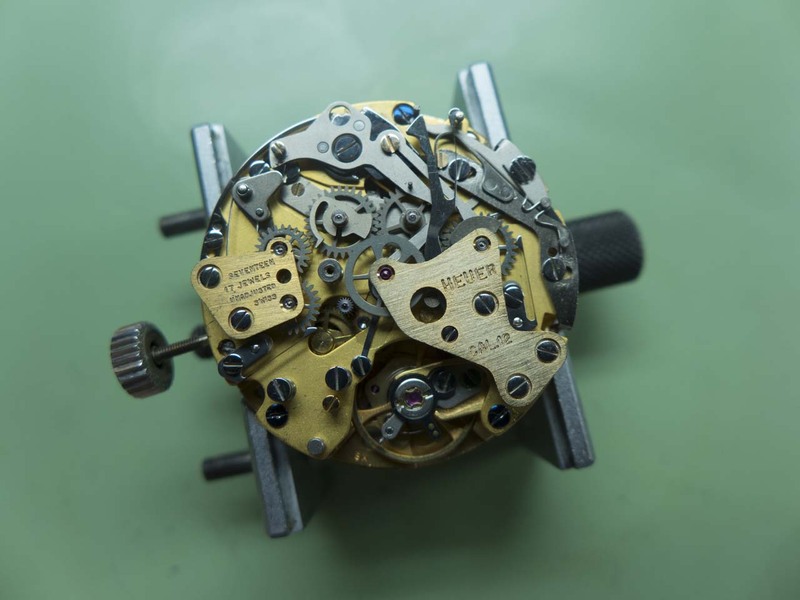 Removing the levers and wheels is quite straightforward, you just need to be methodical, this is the sequence I use on this particular calibre. 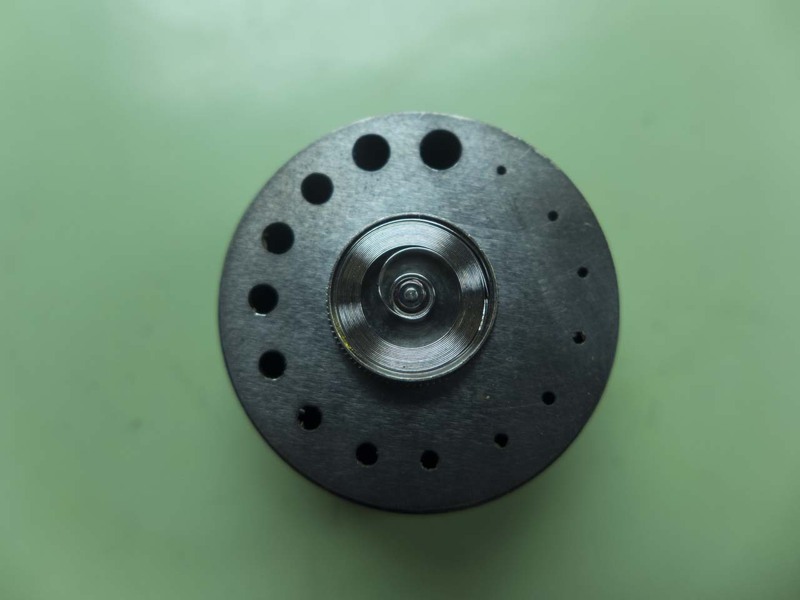 And that’s it pretty much done, the base plate can be removed now. 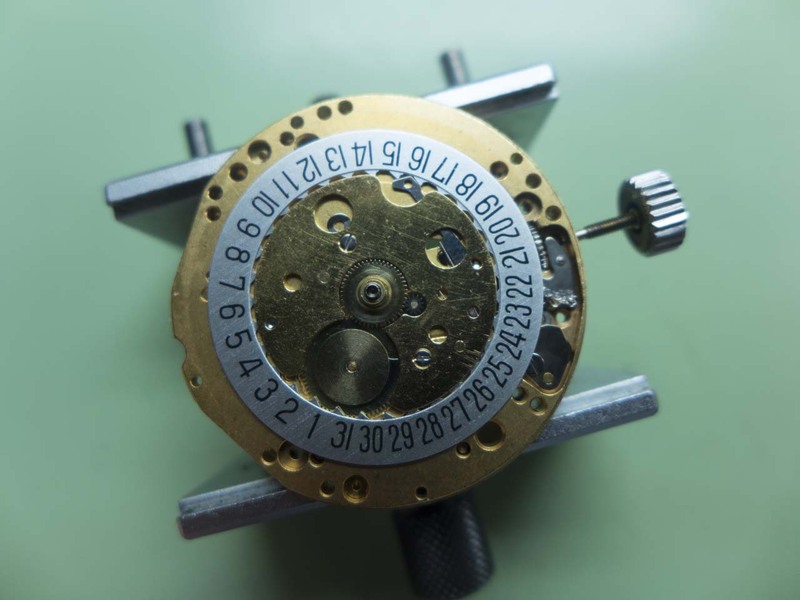 Doing this reveals the Buren derived micro rotor and wheel train. 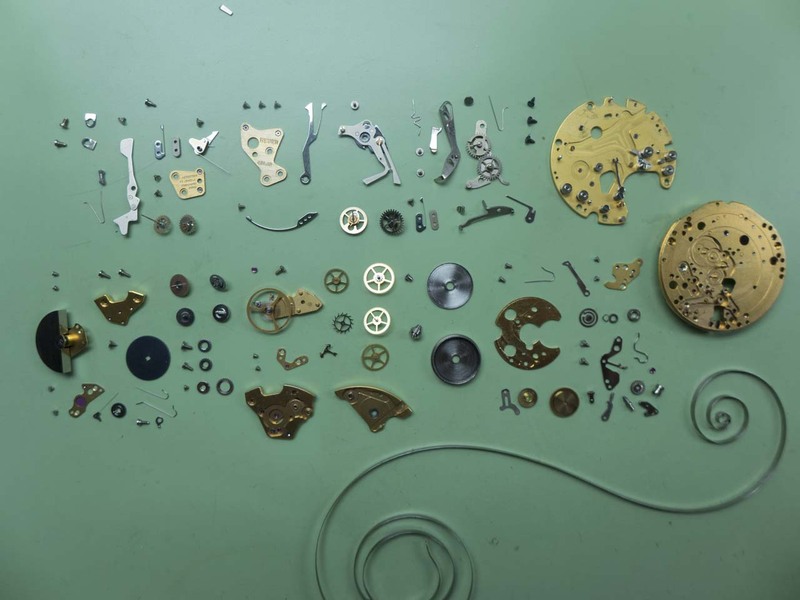 As before, stripping all this is just a question of working methodically. 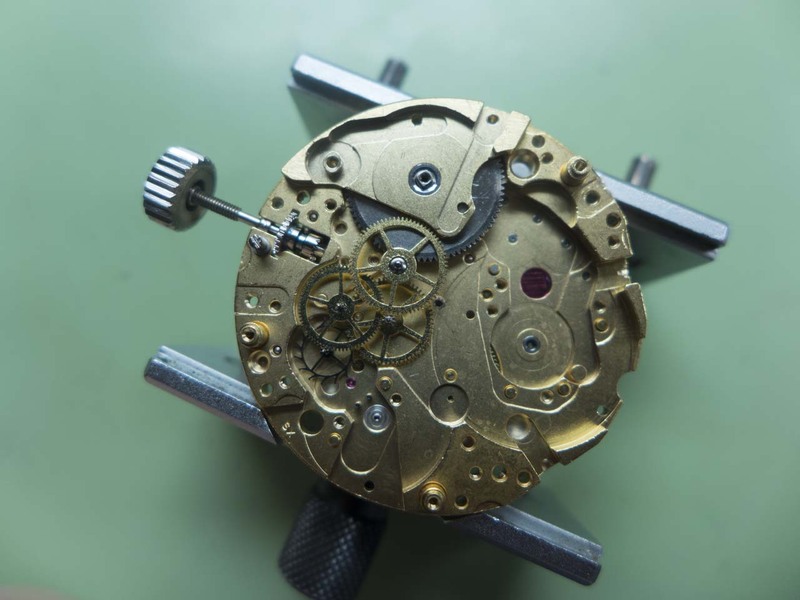 At this stage it’s time for me to turn the movement back over and strip the under dial side. 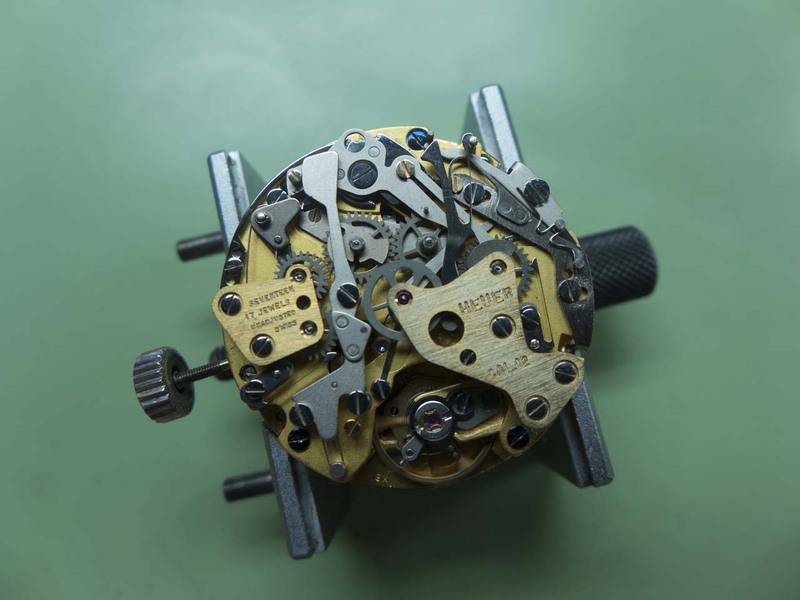 Once again it’s just a question of being methodical. 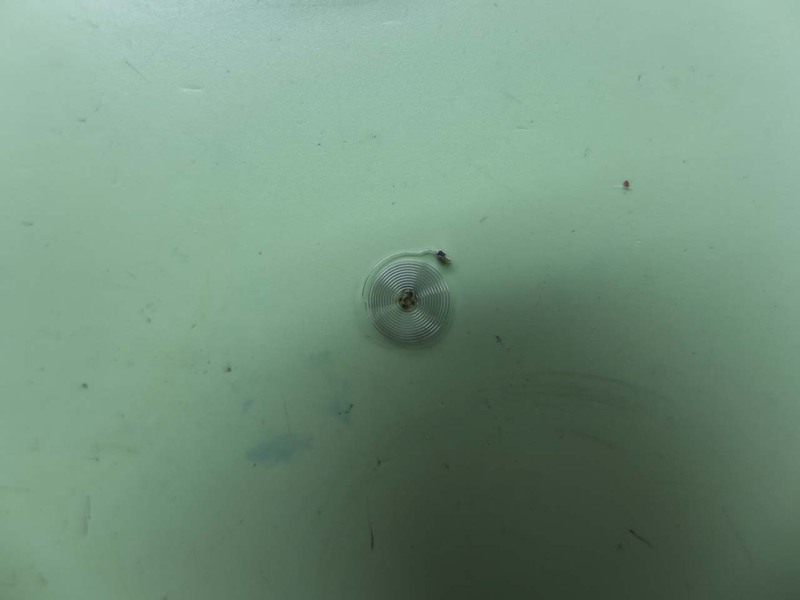 And that’s it, all ready for the cleaning machine. 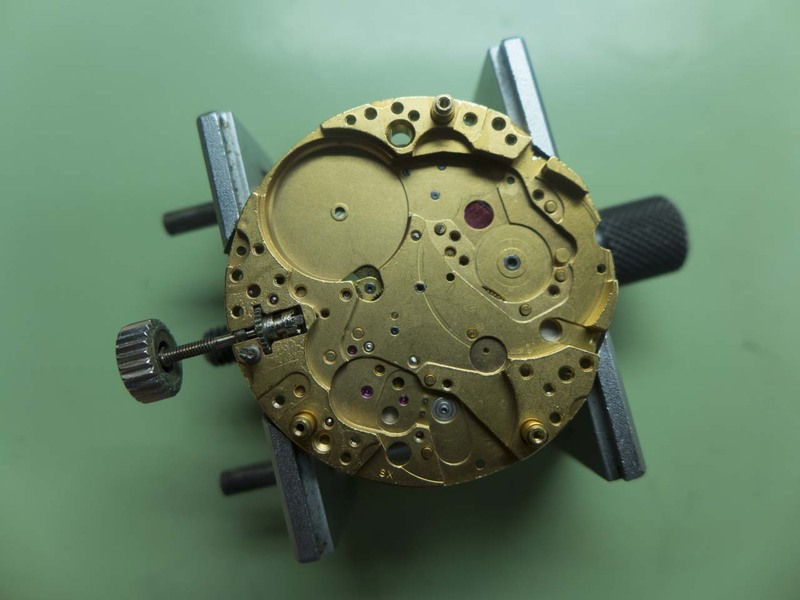 I started reassembly as usual with the balance caps, this makes checking for hairspring concentricity and flatness a lot simpler with no other components blocking my view. 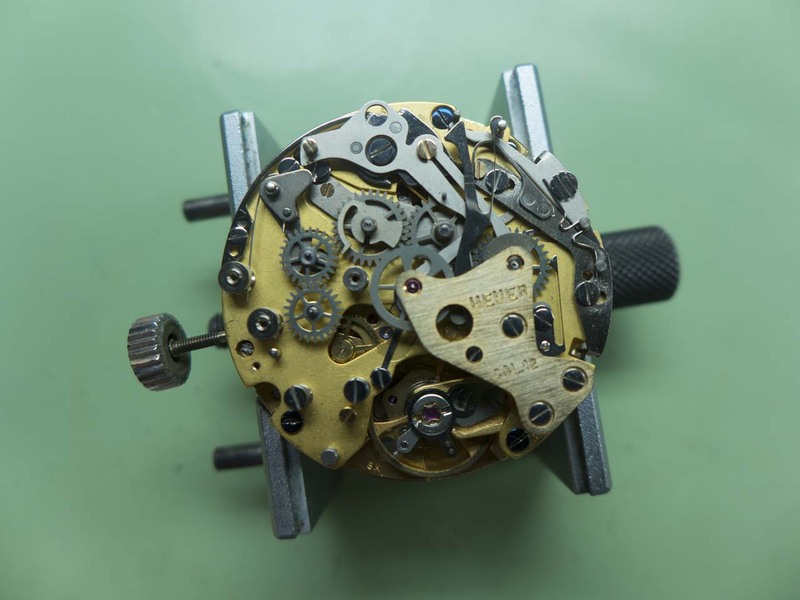 I spotted an issue with the hairspring where it had been badly manipulated in the past, however I left it for now to see how badly it affected the running when the movement was re-assembled. 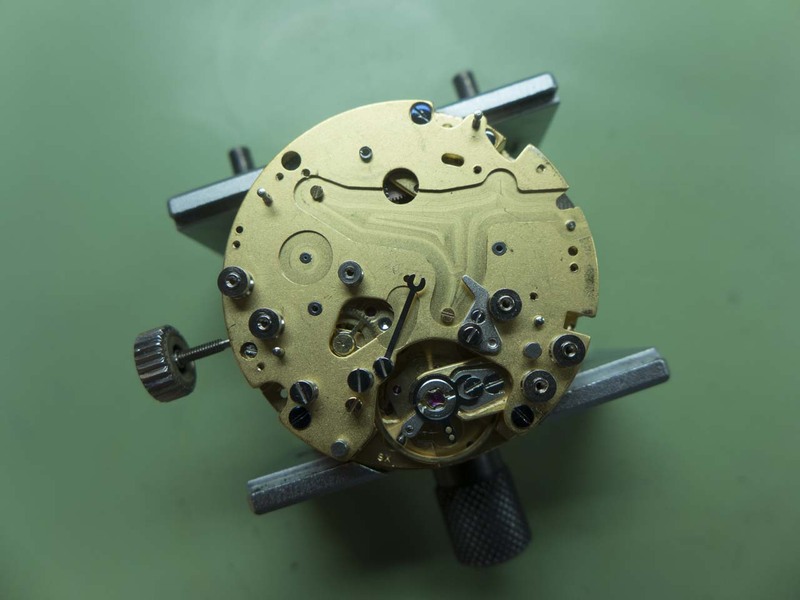 I commenced reassembly in earnest, mainspring first then it’s basically the reversal of the strip down. 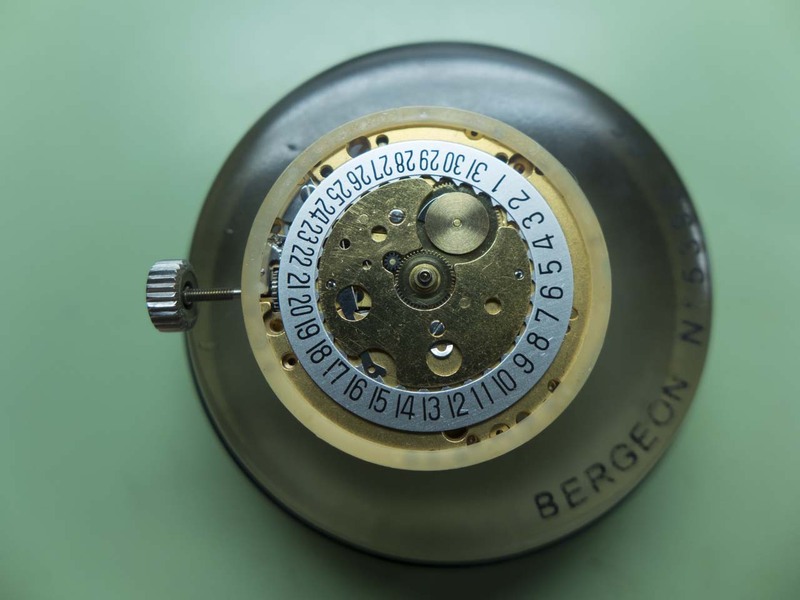 The calendar, motion and keyless work was first. 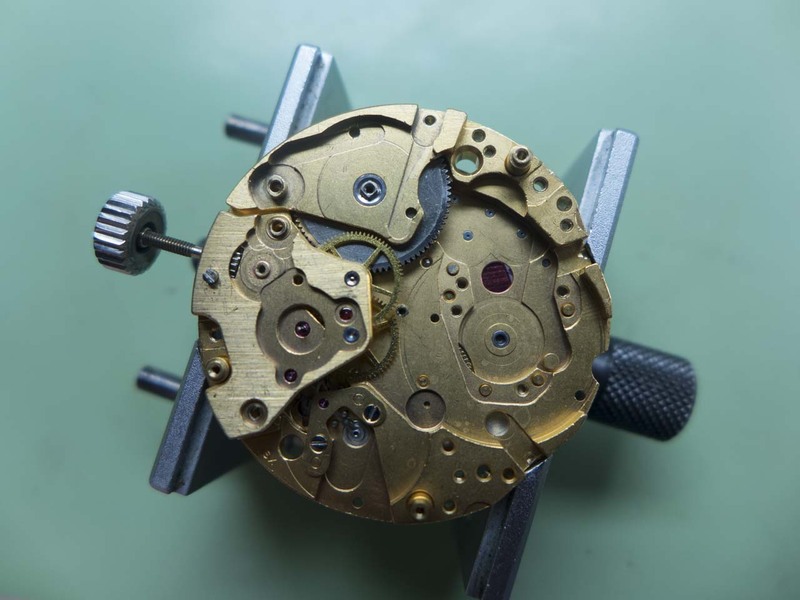 This I could do because of the type of 2nd wheel canon pinion this calibre uses, it can be assembled and fitted from just the wheel train side of the movement. 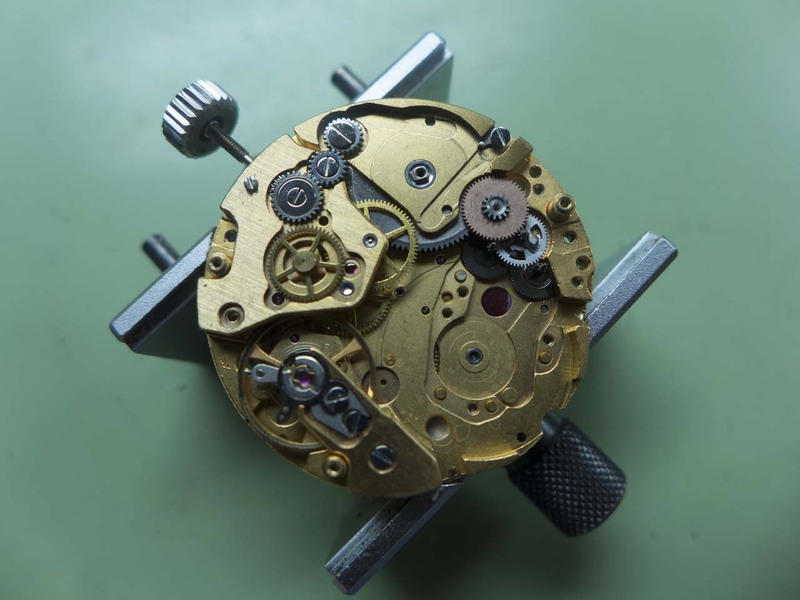 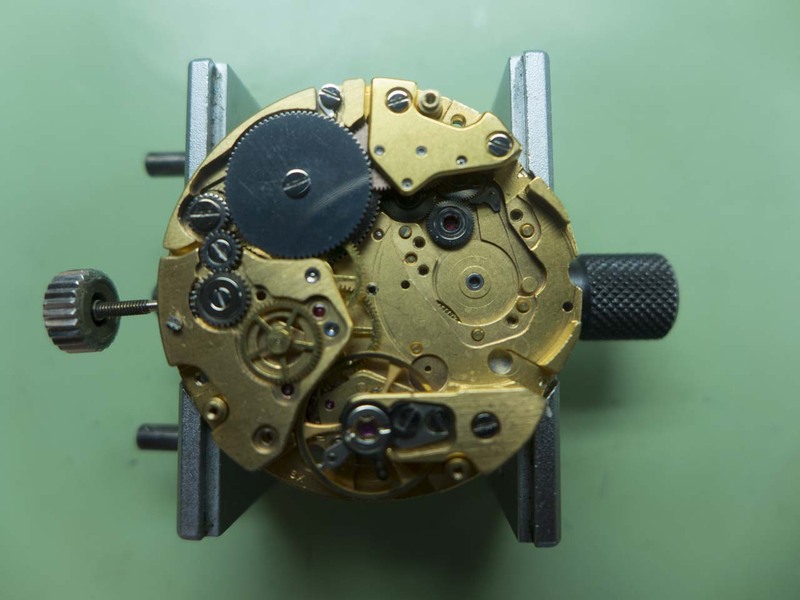 Once in this state I could see how the damaged hairspring was affecting the running of the movement. 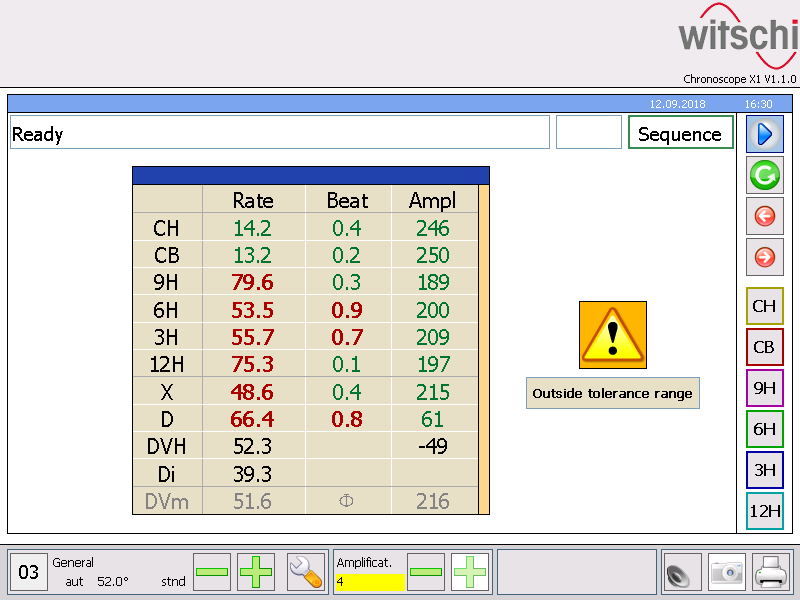 It didn’t look too healthy, but it wasn’t as bad as I expected, here’s a snapshot of the timing figures before any adjustment to the rate, as you can see the delta is very large at 66.4 seconds. 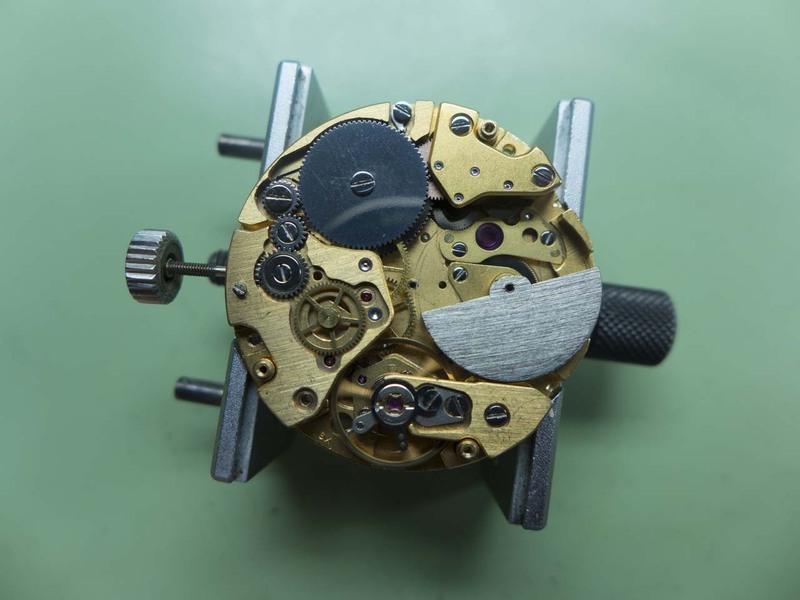 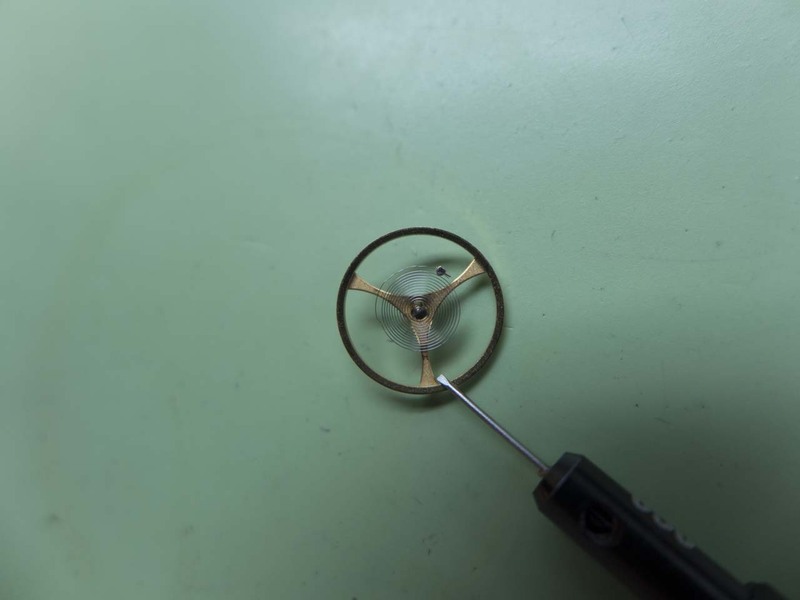 I removed the balance once again to carry out some manipulation of the hairspring. 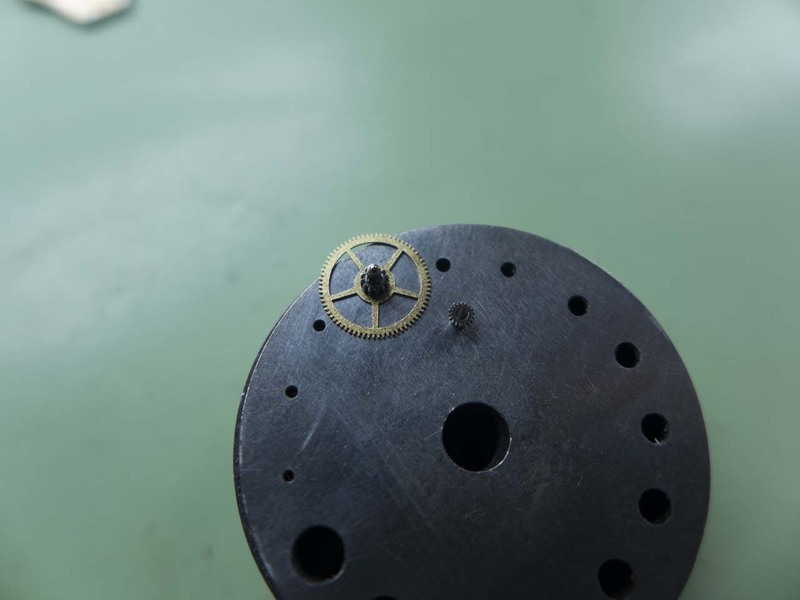 To do this the hairspring has to be removed from the balance. 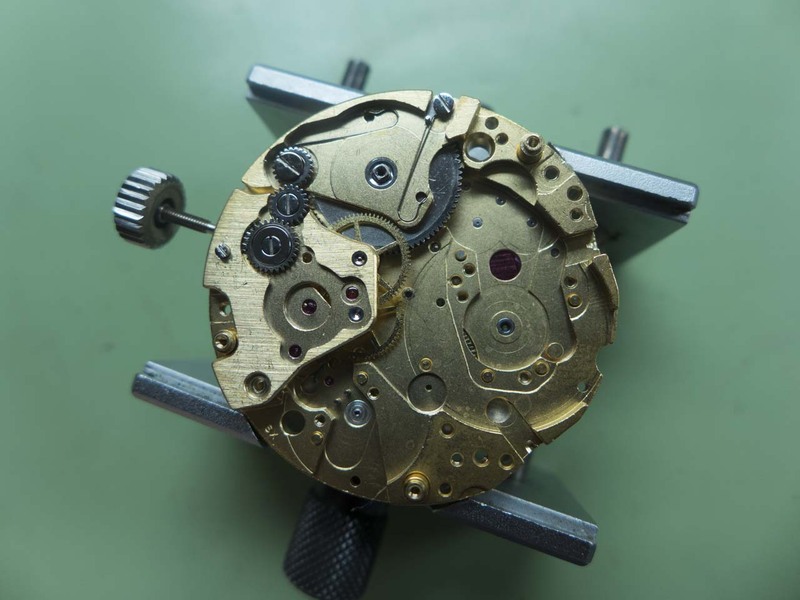 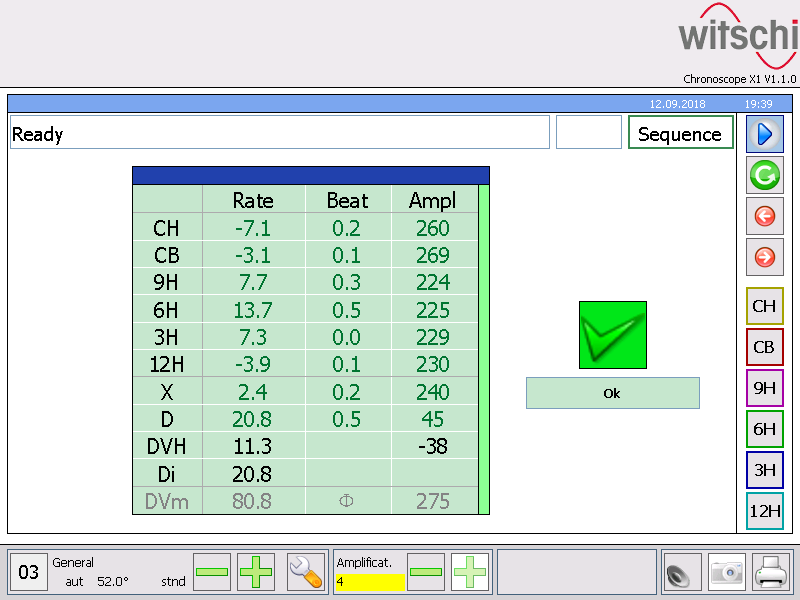 Here it is after I worked it back to the correct shape, however although the delta was much improved the rate was now slow and there wasn’t enough room for adjustment on the cam based adjuster the calibre 12 has to get it where it needed to be. 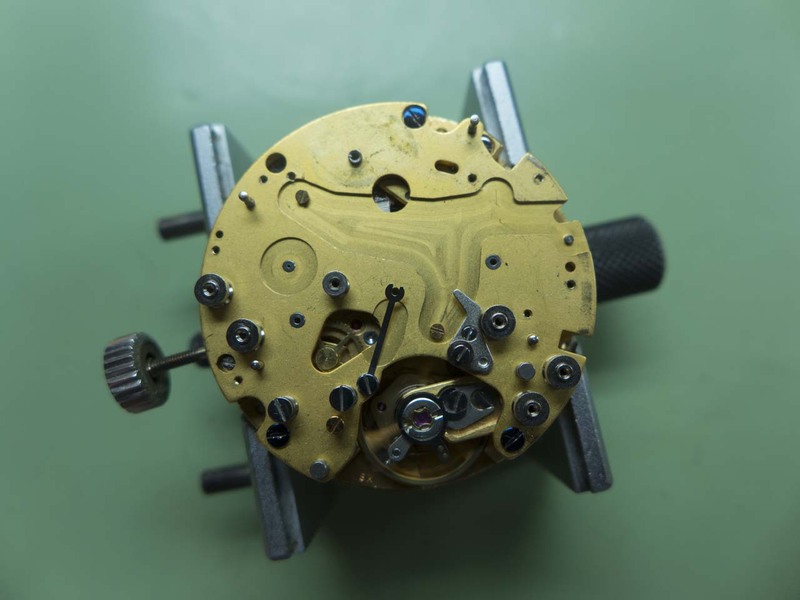 This meant I had to unpin the hairspring from the stud and shorten it slightly. 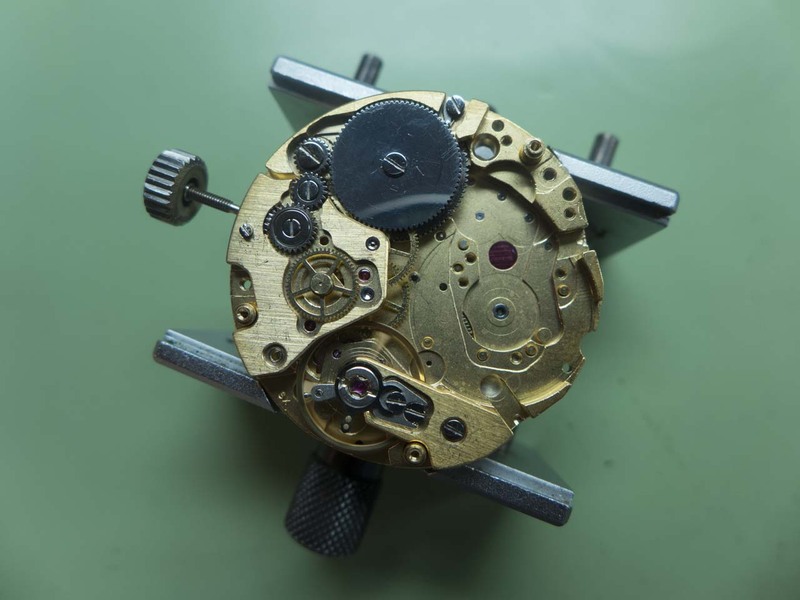 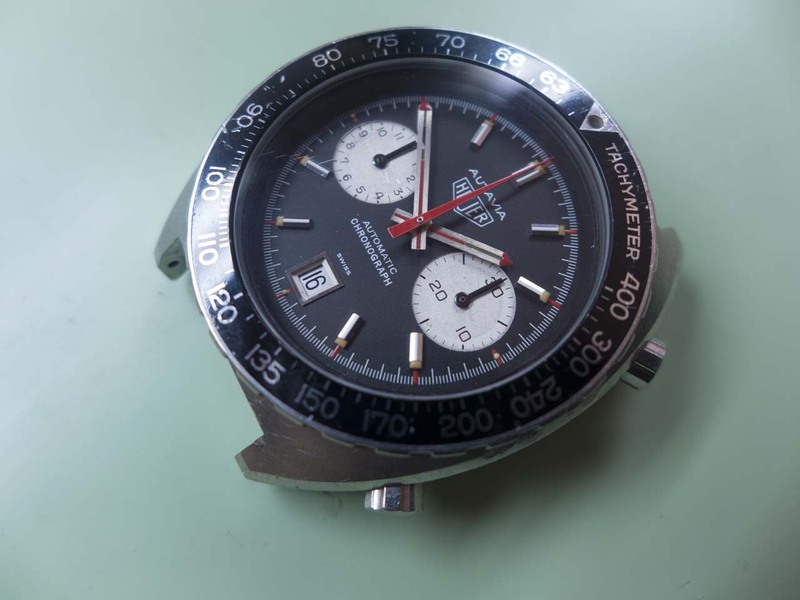 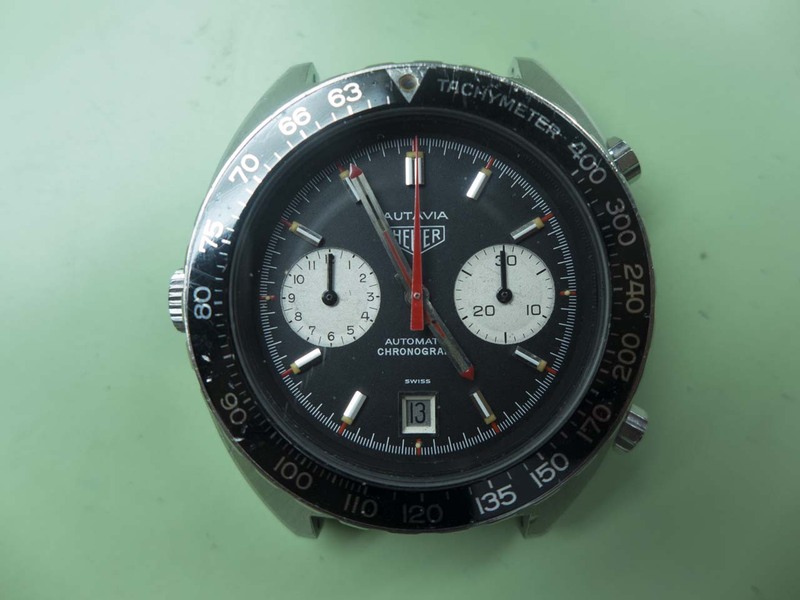 Once I had it running in spec I continued with the reassembly, the autowind mechanism was next…..
…..followed by the chronograph work. 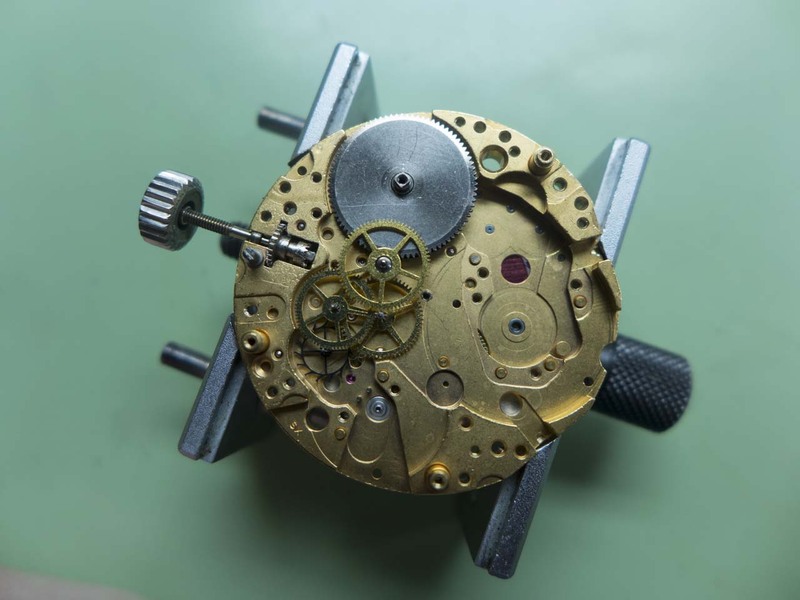 One further point with rebuilding these movements is the wheels that carry the impulse from the minute register wheel to the hour register wheel have to be reassembled in the correct position to get the register to click over bang on the 30 minute mark. 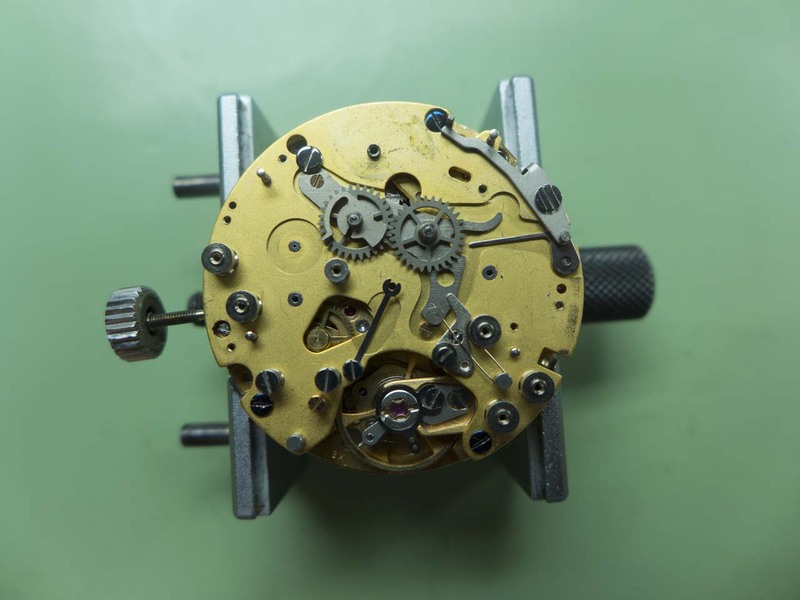 The dial and handset was next. 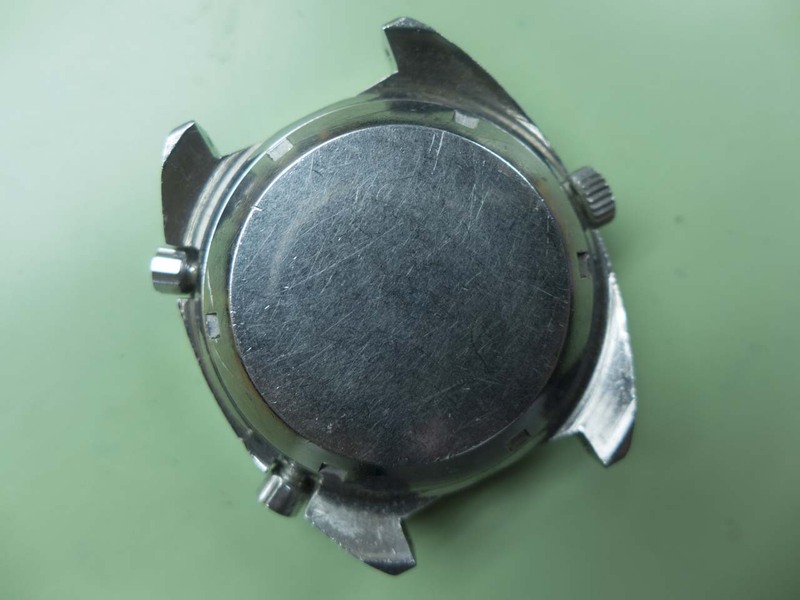 And the watch was cased back up. 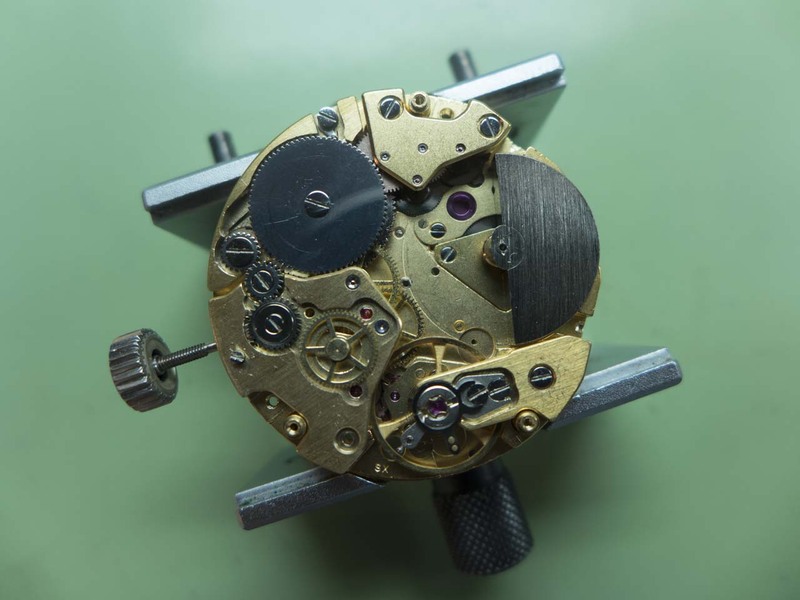 After a few more adjustments I got it running satisfactorily, considering how badly damaged the hairspring was it’s doing very well!